The San Diego MSA multifamily market, as with much of the county, witnessed a general slowdown in y-o-y 1Q total sales volume and transactions/units transacted amounts. As has been extensively reported by various real estate news outlets, for the first time in this current cycle supply has finally caught up to demand. San Diego, despite delivering more units per year in the last 3 years than its 20-year average, 2,126 units, continues to boast one of the highest occupancy rates in the overall West/Southwest at 96.6%. Nonetheless, with deliveries expected to peak in 2018, both occupancy and average rental rates should witness mild contractions, particularly among Class A properties, as developer's vie for renters during their lease-up phases. According to the San Diego Economic Development Council's April 2017 Economic Pulse Report, San Diego's total nonfarm employment increased by 4,300. Compared to a year ago, total nonfarm employment is up 29,600, or 2.1%, with 22,900 of those jobs coming from the private sector. Local government posted the largest month-over-month gain, adding 1,600 jobs in March, of which 1,300 can be attributed to education, leisure and hospitality added another 1,300, and healthcare and social assistance added 1,100 jobs. Unlike other areas of California and the West more prone to the speculative fits of the boom and bust cycle, San Diego has been a consistent performer in both good and bad economic conditions. Whereas many Western markets suffered from decreased rents and occupancy during and after the 2008/9 Great Recession, the San Diego MSA, on the whole, maintained rents with relatively mild occupancy contractions. 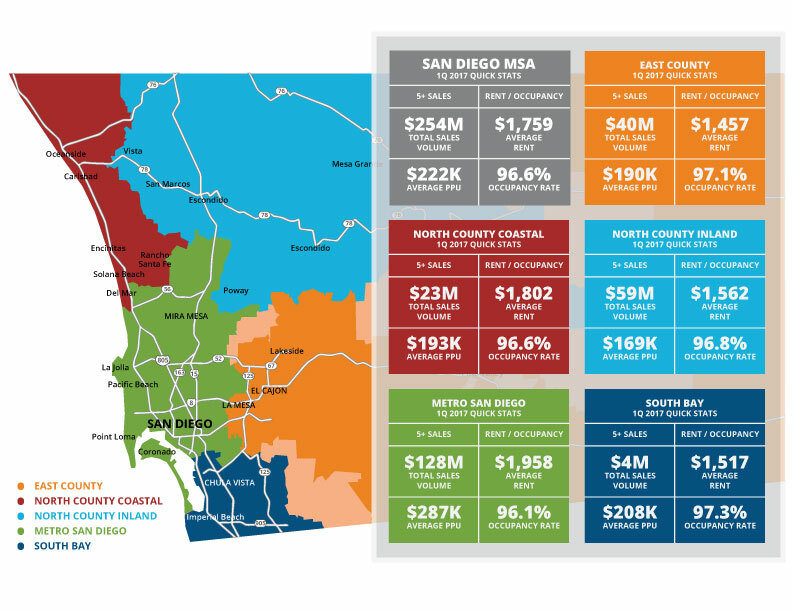 Although 1Q 2017 was less active, in terms of overall sales volume, the region continued to perform well with investors showing continued interest on the interior of the County, particular in the East County and North County Inland Submarkets. sale during the first quarter. 50+ unit properties also saw a significant decrease in sales volume declining (81%) y-o-y to $75.7M with average sales price per unit amounts contracting (24%) to $182,458. It should be noted that much of this decrease can be attributed to investors purchasing more affordable units on the interior of the County. In regards to new construction, San Diego MSA had 430 new units delivered in the 1Q which was nearly (44%) below 1Q 2016's delivery amount. Despite reduced 1Q deliveries, and as referenced at the beginning of this report, delivery amounts are set to increase substantially through 2018. Despite elevated construction delivery schedules over the last several years, average rent for the MSA continued its climb rising 4.3% y-o-y to its current $1,759. Conversely, occupancy witnessed its first mild contraction since 1Q 2013, decreasing (0.3%) to 96.6%. The East County and North County Inland submarkets took the top two spots for highest percentage increase in average rent rising 6.7% (to $1,457) and 5.7% (to $1,562) respectively. In regards to occupancy, the South Bay Submarket narrowly beat East County with the highest occupancy rate for the region at 97.3% and 97.1% respectively. cheaper in average monthly rent, currently $1,562, than it's coastal submarket neighbor, North County Coastal, at $1,802 and $200 less than the MSA's overall average rent. The same holds true for East County albeit with larger average rent differences. Trump Administration. Despite stocks hitting all-time highs, based in large part on investors factoring in massive deregulation, markets the world over have been prone to ever increasing volatility fits. San Diego is poised for continued economic gains, comparative to the region, as both people and businesses have headed south down the coast. As of March 2017, San Diego had the 2nd lowest unemployment rate in California at 4.2% trailing only San Francisco at 2.9%. Given the recent change in US political affairs, San Diego stands to benefit if the proposed increases to defense spending actually materialize. 2017 should see continued, albeit more muted, momentum particularly on the exterior, more suburban areas of the County. With projected completions expected to double by the end of year, particularly in the Metro San Diego Submarket, expect both occupancy and average rents to contract as developers begin their lease-ups.